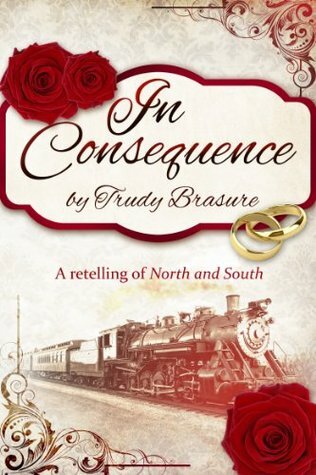 I’ve read In Consequence a while back and it has become one of my favorite fan fiction books from North and South. It is not a continuation, but a variation that starts with Mr. Thornton’s dinner party and follows the premise that it is not Margaret who is hit by the rock during the strike, but Mr. Thornton. This may seem a small change in the story, as Margaret still attempts to protect Mr. Thornton and therefore he still proposes to her, but it is actually an important detail as it soften Margaret’s heart towards Mr. Thornton, and may be the reason why she finds herself accepting his proposal without really knowing why she is doing it. So, what if Margaret felt so astonished by Mr. Thornton’s proposal she says yes? Can you imagine it? I can, and the possibilities that would come from this change made me want to continue reading this book for hours and hours. After the engagement, the book continues with Bessie’s death, Nicholas discovering about the engagement and Margaret feeling she has made the wrong choice. This premise was written in a very realistic way and it felt very true to the characters, especially because the author shows us their inner struggles regarding these changes in their lives and decisions. Mr. Thornton starts thinking about what Margaret’s opinion of him might be and decides to show her how affectionate and caring he can be. He sends a beautiful coffin for Bessy and writes a letter to Margaret that is so sincere and touching, that she is persuaded not to break her promise to marry him. From this moment on, we see John trying to prove he can be worthy of Margaret but always feeling insecure about what she thinks and feels torwards him. I must confess I loved this Mr. Thornton as much as I loved seeing how Margaret’s affection for him grew. It was delightful to see Margaret realizing how much Mr. Thornton affected her, and endearing to see her slowly falling in love with him. In Consequence is full of Margaret and John moments and it is perfect for someone as romantic as I am. Their time in London was beautiful to read as their debates were interesting, witty and showed how much they respected one another. With all this, Trudy Brasure gave me a joy I have not felt with some other North and South fan fiction books. I don’t want to give too much away, but obviously, the couple will be madly in love in this story and, once Margaret is certain she loves Mr. Thornton, we witness a lot of romantic moments that make this a very romantic book. However, despite loving the romance in the book, I think it’s value was increased by the fact that the author did not forget North and South was not only a romance , but also a portrait of society at the time, a description of the struggles several classes were facing. In In Consequence, those aspects are not dismissed. We still see the workers struggle, and we see Mr. Thornton getting to know them better. We also see Frederick, and are even presented with his perspective in the story which was an added value I truly enjoyed. In Consequence is much more than a romance, it is a true homage to Mrs. Gaskell’s work.